Jordan Fliegel is an entrepreneur and early-stage investor who is heavily involved with several leading venture-backed startups at the intersection of sports and technology. He is currently the co-CEO of DRAFT, an innovative, fast-growing daily fantasy sports company headquartered in NYC. 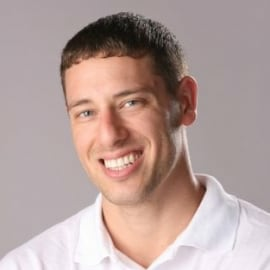 Before DRAFT, he was Founder and CEO of CoachUp.com, the nation’s leader in the sports coaching industry, headquartered in Boston. He is also co-founder and Chairman of Athletes of Valor, a social impact for-profit platform that helps veterans transition from service to career, by leveraging the power of collegiate sports, with a mission of having at least one veteran on every college sports team. With over 20,000 coaches and personal trainers nation-wide, working with hundreds of thousands of athletes, conducting thousands of one-on-one and group training sessions and clinics every day, in over 30 sports, CoachUp has won numerous awards, including being named one of America’s top 30 “startups to watch” by Entrepreneur, and boasts an all-star line up of talent including NBA Superstar Stephen Curry as a lead spokesman and partner. The company has been featured hundreds of time on TV and in national press on outlets such as Live with Kelly & Michael, Late Night with Seth Meyers, Fox & Friends, the Wall Street Journal, Forbes, Inc., Time, Fast Company, and USA Today. Jordan is also active as a startup investor, advisor, speaker and author. He is co-founder & General Manager of Bridge Boys, a seed-stage investment fund with over 40 investments to date, a formal advisor to several venture-backed startups, a Mentor at the Boston Techstars accelerator, a frequent lecturer at business schools such as Harvard, MIT and Babson, a guest columnist at Inc.,  and is the author of  Coaching Up! Inspiring Peak Performance When it Matters Most (Wiley & Sons). In 2014 Jordan was named to Boston Business Journal’s “40 under 40” list, and in 2015 was named “30 under 30” in America, by Inc. Magazine, and a Finalist for “New England Entrepreneur of the Year” by Ernst and Young. Personal: A dual US/Israeli citizen, Jordan earned a B.A. in Philosophy & Government from Bowdoin College, and an M.B.A. from Tel Aviv University. Before joining the startup world, he played professional basketball in Israel and Europe.